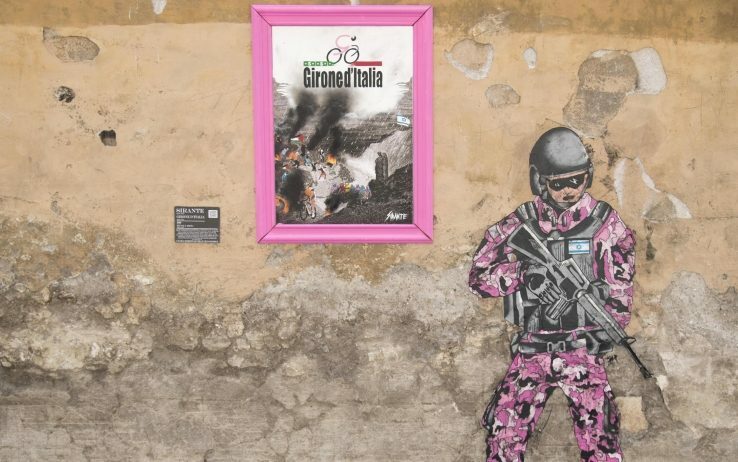 Rome, Italy: new piece by Italian artist Sirante about Arab-Palestinian conflict and the controversial departure of the cycling competition from Jerusalem after the rise of the conflict and the opening of the US Embassy decided by Donald Trump. The installation appeared on the occasion of the last stage of the Giro d’Italia, which today runs through the streets of Rome. In a pink frame, the Italian poet Dante, accompanied by Virgil, walks in the mountains of Jerusalem. From above the two observe the departure of the Giro d’Italia in the flames and thick columns of black smoke. On one side the flag of Israel and on the other the burning Palestine. In the middle the cyclists who pedal, indifferent. Above the Italian tricolor with the symbol of dollars on the green strip. Close the canvas, a notice explains the work as in a museum: “Years of fierce violence legitimized by the power of dirty money and blood”. And then he concludes: “There are those who create hell, and those who suffer it”. Near the canvas there is also a poster glued to the wall that portrays a military armed with a pink uniform: on his chest he carries the Israeli flag. Ho seguito il Giro e posso assicurare che Dante e Virgilio non hanno partecipato alla corsa. Però sarei stato curioso di vedere Beatrice come miss.